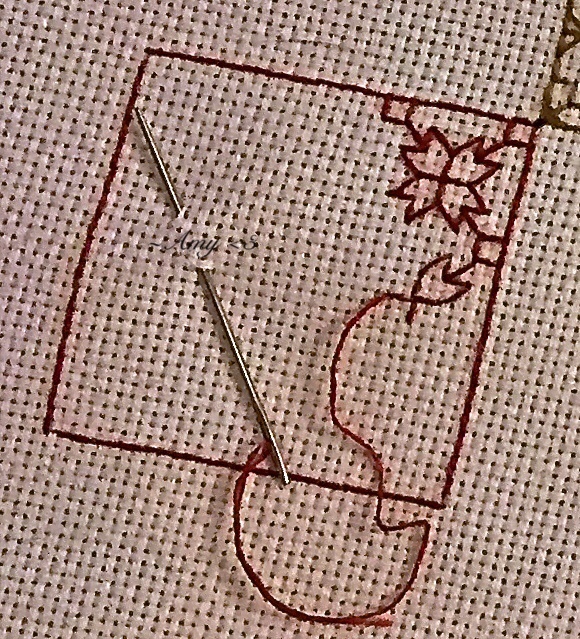 While rummaging around in the old hand-painted storage chest that houses my collection of fabric, embroidery floss, and pattern books, I unearthed a piece of unfinished embroidery I began designing years ago. I imagine I set the project aside to work on making a gift for someone else – a Christmas ornament, perhaps. Life got busier, days dissolved into years, and I forgot all about this half-finished patchwork until I unrolled it and held it again in my hands. I was surprised by the prettiness of the intricate patterns I devoted my time to years ago. I thought to myself, it’s funny how the process of creating a work of art –whether it’s stitched or composed or painted or sculpted or written– can be so much like life: when you’re deep in the middle, you can get so close to it, become so accustomed to its contours, or so annoyed by distractions, or dejected by your mistakes, that you can’t see it clearly anymore; you can forget how beautiful it is. 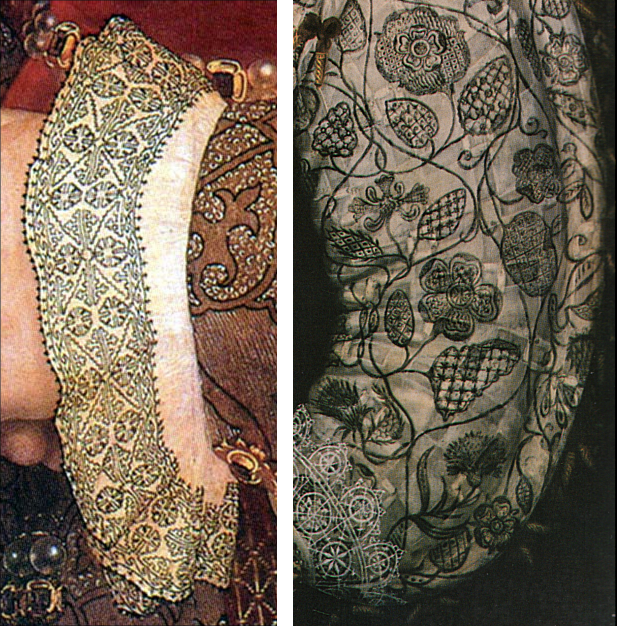 Although the patterns in blackwork appear complex, they’re actually easy to stitch. Each design is created by outlining a shape with a running stitch, then by sewing one simple, straight stitch after another to form a pattern. I run my finger over my own tiny stitches and meditate on this unfinished piece of blackwork. The flight of years, the joys, sorrows, sunlight, and shadows through which I’ve passed have made me view this piece differently now than I did when I began it. These stitches have moved from something merely decorative towards something more metaphorical. 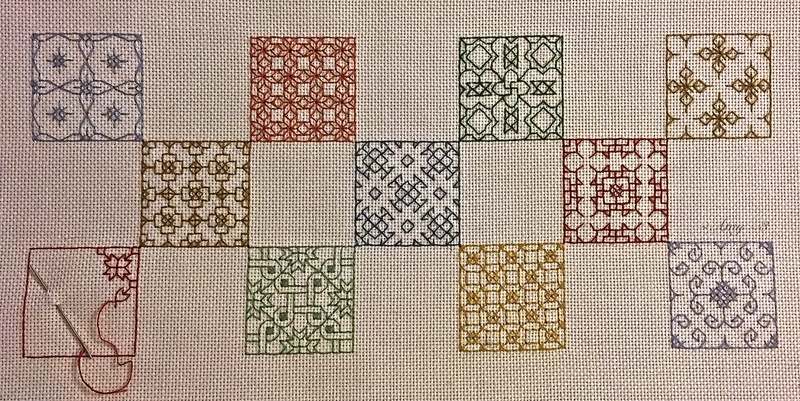 You might care to guess which square is my favorite. I’ll tell you: it’s the unfinished one. Why? Because it holds possibilities. It’s not too late to go back and begin again with a brand new color, or even an entirely different pattern. Just as in life, it’s not too late to change, and that’s what I find appealing. However, I’m content with the color and pattern I’ve chosen, so now, all I must do is take up my needle again. It’s been a long time, but I know how to do this, of course I do! Just as in life, I can move forward at any time with a pattern of my own choosing. How do I begin? It’s simple, really: day by day, moment to moment, breath by breath, stitch by stitch. Just look at this beautiful work of art I’m creating.